The William F. Bolger Center’s beautiful grounds and historic buildings are the perfect backdrop for your special event here in Potomac, MD. Whether you are planning a joyous celebration, fairytale wedding, or glittering social event, our extraordinary grounds and unique estate have everything you need to make your event both memorable and successful. Select your venue: the historic Stained Glass Hall, a chapel that is original to the property, or the elegantly appointed Franklin Ballroom. 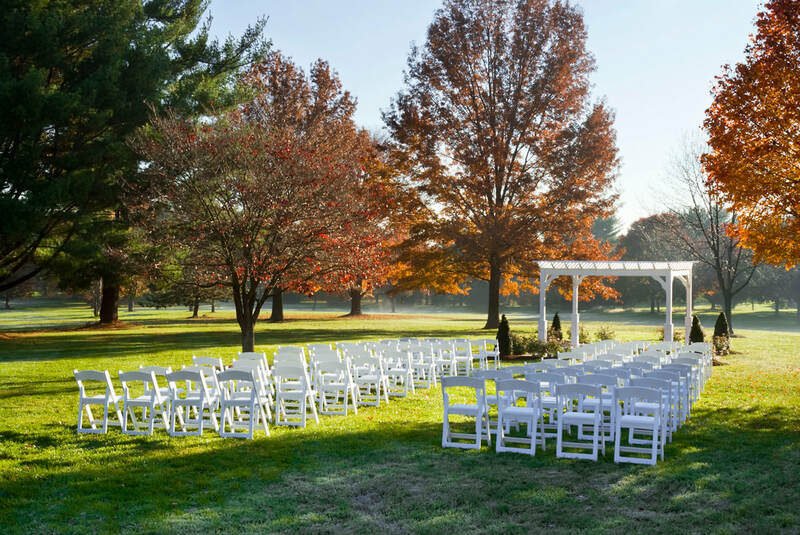 Our 83 acres of picturesque grounds and meadows also provide a beautiful setting for outdoor ceremonies, receptions, and special events. Proudly voted a Couple’s Choice Award winner by WeddingWire three years in a row! ​The Stained Glass Hall is an original and historic venue on the William F. Bolger Center grounds. The stunning hall has beautiful vaulted ceilings and soaring stained glass windows that line each side of the room, creating a beautiful setting for your special day. The hall offers 3,040 square feet of open space which can accommodate various event setups. ​Our larger ballroom offers over 7,000 square feet of elegantly appointed space for your event. Every modern convenience is available, from state of the art audiovisual technology to modern lighting and seating arrangements. Adjacent to the ballroom is a beautifully manicured garden and reception courtyard. ​The Overland Room offers 1,500 square feet of space which can accommodate various event setup. Ideal for a more intimate event, this smaller space offers easy access to the campus’s lovely exterior gardens. With stained glass windows and a vaulted ceiling, this venue is ideal for special occasions and ceremonies. At the William F. Bolger Center, we understand different events require different solutions, and each event should reflect the individual desires and styles of the clients who are planning them. Our dedicated planners are here to help you design each aspect of your event, using both attention to detail and artistic flair – from the latest trends in décor and catering to the best in entertainment and guest services. Contact our team of experts to choose from our extensive list of packages and enhancements, or create a completely customized event to make your day memorable for you and your family & friends. We welcome the opportunity to serve you, and look forward to helping you plan and celebrate your special day.